Posted on June 2, 2017 at 10:00 am. Made in London, Ontario, Canada, Booch has a thicker mouthfeel, finer bubbles, and a more bright and distinct flavour than other kombucha brands. They also come in squat, brown bottles with screw-top lids that can be reused over and over. Their ingredient lists are simple and perfect. These balls are organic and gluten free, and come in packs of two. Their maca powder adds a definite pick-me-up without adding caffeine. It was this that woke me back up during 11 pm driving in northern Ontario. These are another kind of ball – a good snack without the perk. They are organic, vegan, gluten free, and paleo, and come in a number of flavours. They do likely contain glycerin by way of the organic vanilla extract. Another macaroon, this one is more moist and has a cashew base. They also come in multiple flavours, and are organic, vegan, gluten free, and paleo. These also likely contain glycerin due to organic vanilla extract, but it was worth buying them to taste and to get the recipes to try to make them at home with vanilla powder instead. They are that good. 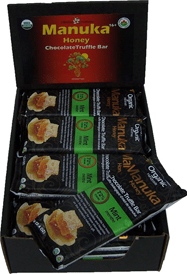 An actual truffle bar for people who can’t eat much. These bars are also organic. They come in a variety of flavours, but I have only tried the spice bar and the mint bar. “Spice” is very spicy for my tender palate. Mint is good but contains mint oil, which could be a problem for some. Disclaimer: These bars are made in a facility that processes a number of allergens. Other flavours may contain milk ingredients. I did a lot of compromising on my trip, and this was yet another one. This bar may contain dairy (made on the same equipment), though it is organic and vegan. I tried two varieties – the treasure bar is a peanut butter crunch and caramel bar and the celebrate bar contains caramel, coconut, and almonds. Delicious. Every live. product I have seen is raw, vegan, and organic. While some vanilla-containing products contain vanilla extract (possible glycerin concern; I’ve avoided these), others use vanilla powder. I have had cashew-based smoothies, a frozen carrot spice cake (cheesecake-like), and almond chocolate squares, and every single thing I’ve had has been reaction-free. I hope to make my own smoothies based on their recipes for at-home use. The products themselves are not cheap, but they are worth it. Gluten free, nut-free, vegan, and organic, these chocolate coconut macaroons taste amazing. Downsides: They need to be stored in the freezer and a bag of 12 is $16. 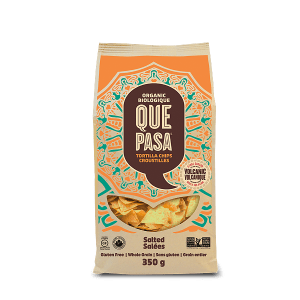 Delicious organic tortilla chips. Not much else to say. Need some popcorn but no access to a popper? This will fill the craving. Only four ingredients. Have a favourite commercial propylene glycol-free snack? Comment below.